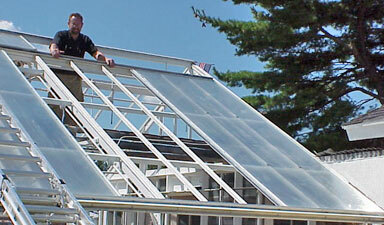 There are many old lapped glass greenhouses remaining in use throughout New Jersey, but these greenhouses present a number of problems. Slipped glass, high energy costs, and drips washing out seedling trays have moved many owners to consider costly replacement or even abandonment. At Rutgers New Jersey Agricultural Experiment Station, an old greenhouse on the G. H. Cook Campus used by turf breeders sorely needed re-glazing. 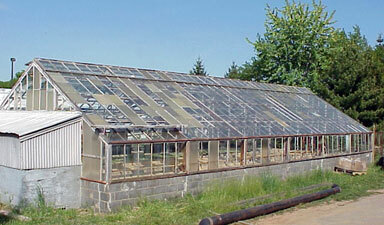 It was debated whether to reset the original glass, re-glaze with a double-wall plastic panel, or demolish the greenhouse. There were many factors to be weighed: costs of the project, energy conservation, maintenance issues with glass vs. plastic, and overall life expectancy. After calculating how much time it would take to clean, caulk, and reset the glass, it was decided that the greenhouse would be re-glazed with 8-mm polycarbonate. 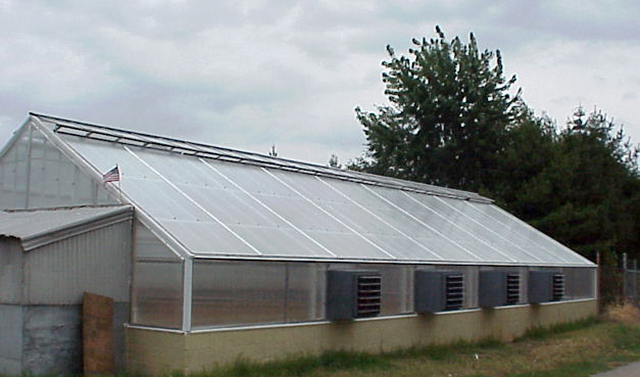 All work was performed by Rutgers' fabrication shop and greenhouse crew to reduce expenses. 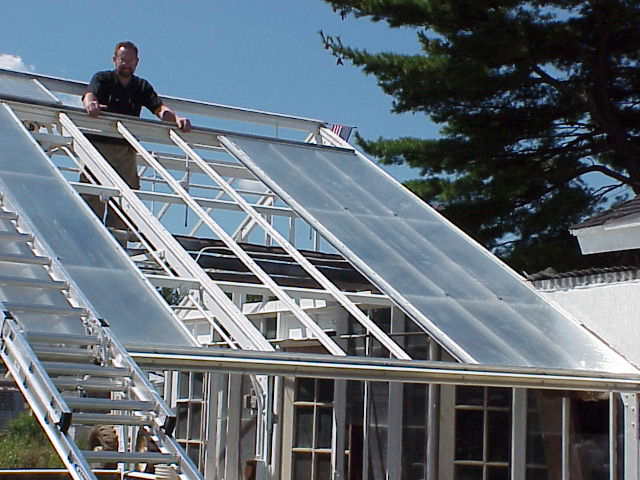 Experiment station staff made sure the greenhouse structure was in good shape and that the heating and cooling systems were in working order before starting. A re-glaze is an investment lasting at least 10 years, and these components need to function for that long. If old wood glazing bars remain in good condition, they can be painted and reused to support the new glazing system's aluminum extrusions. This was done for the re-glazing project, which further reduced costs. Through hard work and a little ingenuity, the greenhouse staff were able to save the greenhouse from demolition, and the result is a leak-proof, draft-free greenhouse and a substantial savings in energy use (approximately 30%). 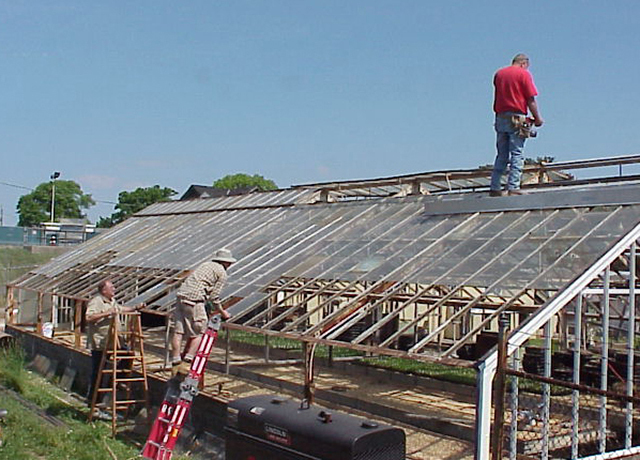 To learn more about greenhouse management, read through our publications. For information on this project, please contact Joe Florentine. 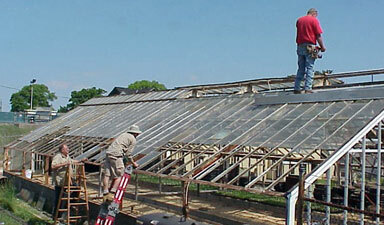 Before: greenhouse in need of repair. In progress: removal of glass.